Wood Source is a Wood Products Distribution Company located in Thornton, Colorado specializing in Pacific Northwest Softwoods. Founded in 2000, Wood Source has supplied major projects in Southern California, Lake Tahoe, Aspen, Steamboat Springs, Breckenridge, The San Juan Islands of Washington State and services the entire Rocky Mountain West and beyond. Wood Source is a division of Patrick Lumber Company, which has been in business since 1914. This allows both companies to establish and maintain close relationships with all the major mills in the Pacific Northwest. Wood Source is dedicated to the service of their customers, providing the best value and high quality material. Our mission at Wood Source is to service our customers through their needs and not our own. Since 2000, Wood Source has seen consistent growth both financially and physically, finally settling in Thornton Colorado on over 10 acres. 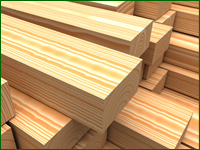 Our Current facility offers on site hand hewing, 2 re-saw machines allowing 50’ timbers, and over 500,000 bf material in stock. We hope to offer our services in the near future. Timbers, flooring, ceiling, clear finish, all grades available. Decking, siding, clear grades only. 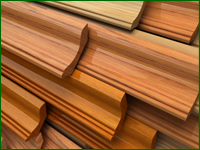 Roof, decking, cedar/Doug, Fir/knotty pine, all grades available. Paneling, roof decking, log siding, hand hewn, all grades available.